In 2013, we took the bold step of getting our wheels tested and certified for UCI approval and usage in UCI sanctioned events. 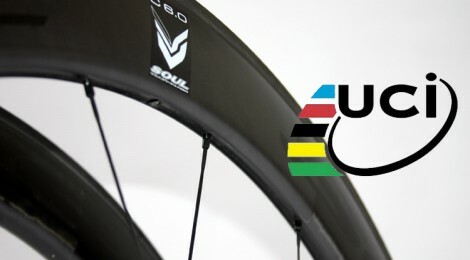 We are proud to announce that we were successful in obtaining UCI approval for our C5.0T and C6.0T wheelsets. The criteria for approval involves a series of crash tests that would scare even the strongest steel rims, but our wheels managed to pass them all and then some. the slide hits the wheel offset in relation to the initial position (simulation of an impact similar to that of hitting the kerb or a large pothole in the road). Spoked wheels are tested in two different positions, with the impact occurring either directly against the spoke, or between two spokes). The impact tests are filmed by a high-speed camera (600 images per second) in order to evaluate the risks engendered by damage, if any, to the wheel. Filming takes place behind a protective PMMA screen. A recording is supplied showing the impact at three different film speeds. You can find a list of approved wheels here.